If feeling intimidated by the gym keeps you from realizing your maximum health potential, it may be time to rethink your approach. Developing a positive rapport with a gym is not unlike any other relationship. For you to fully enjoy (and stick to) your program, you need to feel comfortable and capable to be effective. We have all been in relationships in which we felt insecure. Maybe he kept you guessing with his infrequent phone calls, or made sarcastic or critical commentary. This can make for an uncomfortable, unhappy relationship. Of course, you don’t want to feel inept or judged in a gym setting, either. If you have several pounds to lose, you may feel self-conscious about entering a fitness facility. The reality is, you have to start somewhere, and good for you for starting. People in a gym setting share a common goal: getting fit. Most gym-goers are not inclined to criticize an overweight patron; they salute them for making the effort. Remind yourself that even the tautest body has flaws and then, as you learned in speech class, pretend everyone around you is naked. There is a lot of equipment at a gym, in free weights, machines, and components. How do you know what to do with all of it? 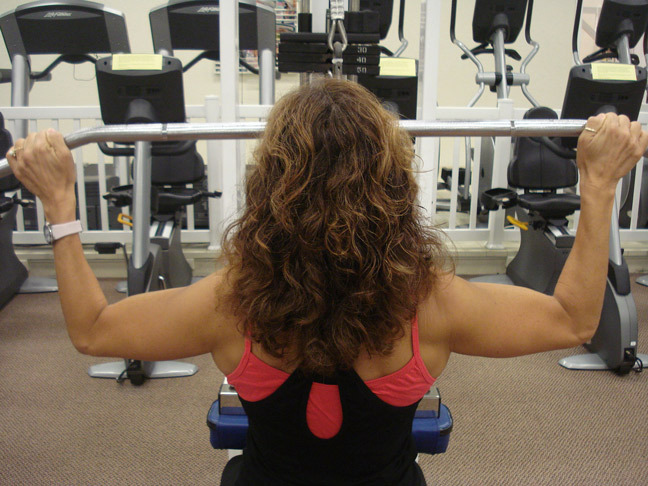 Schedule a training session or two with a personal trainer. Many gyms offer a complimentary hour with a fitness professional to familiarize you with the facility layout. If this is not an initiation incentive at the club you join, consider investing in 1-3 sessions to get you started. Your trainer will customize a plan for you and prescribe a workout you can reference in the future. Ask for a biography on each trainer and choose one who is most similar to you in philosophies and goals. The fact is gyms are filthy places. The equipment and benches certainly can harbor harmful bacteria and viruses. If you are as germ-phobic as I am, the gym really can be a daunting place. If your gym doesn’t provide its own paper towels and cleaning solution at stations, carry your own. Stock your bag with antibacterial wipes, in addition to a towel. Wipe down your equipment before you use it (in addition to after), and lay your towel down on each bench as a barrier. Post workout, shower at the facility immediately (don’t forget flip flops) and stash your dirty clothes in a plastic bag until you can get them in the wash.
Let’s be honest. Men are visual creatures, often with not-so-subtle wandering eyes. How can you workout when you feel like you are being looked up and down? If you feel uncomfortable or inferior in a male-dominated gym setting, rethink your schedule. The after-work-hour in many gyms has typically been commanded by the “meathead” crowd. Consider adjusting your workout timeframe and squeak it in at lunch or in the early morning. Another alternative is joining a women’s only club, and skip the wayward eyes. Are you anti-indoor workouts? Does the idea of a gym make you want to yawn? Breathe some new life into your routine and give the gym a chance. For variety, try out a new class, like Body Pump, Cardio Kickboxing, or Booty Camp. Often times, trainers will even take the class outside for intervals to provide an unexpected challenge. Gyms are wide and varied in price, classes offered, equipment, and clientele. Shop around and tour several to decide which one will best accommodate your needs. For a few dollars a day, a gym membership in a comfortable environment is a great investment in your health.